These don't have the best looking topsheets but "beauty is only skin deep". What they lack in appearance they more than make up for in personality. A great ski for the one-ski quiver. Obviously not a deep powder ski or a race ski, short of that it does it all. Not too springy and not too damp...a predictable fun ride. I'm 5'9" 165lbs. on a 171cm. Hey there. I'm looking at the Blackeye as well as the Whiteout and Highoon. I'm about your size. 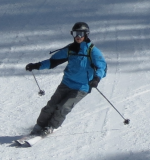 I am a high intermediate or so level skier who has been on hiatus for the last 8 years, and I ski mostly at Mammoth, 70/30 on-piste/off-piste. I am not very experienced in anything deeper than boot high powder, but intend to learn. I am looking to buy my first pair of shaped skis. First of all, do happen to know how the Blackeye compares to the Highnoon and Whiteout? Also, for the Blackeye, do you think 171 is the right size for me or should I go down 1 size? I am a bit confused about how demanding the Blackeye is. Also can you confirm or deny any of the following? Many reviews say it is best for EZ-Expert and above skiers, while others say it is fine for even low intermediates. Some say it requires a fair bit of energy to get the most out of it, while others describe it as effortless and forgiving. Some have said that the Blackeye is barely serviceable in the bumps, while others say it is no problem. I hope I am not too late since your original posting in December to weigh in.? I have a pair of Blackeyes at 171.? I absolutely love them.? They carve like fofo GS skis on hard pack and have worked well in powder up to my knees!? I am 5'10" and 175# so they sink into the powder more than a "wide ride" ski with my weight.? As a one ski quiver I can not imagine a better ski. Just spent a week at Big Sky with the Blackeyes. Don't fear these as they are very forgiving with a huge sweet spot...no problem in moguls...great edge hold too. For a one ski quiver I don't think it can be topped. are they a ski that is best suited in one's "normal" length/size, or would it be recommended to either go up or down one size? IT wasn't so much that I heard they were not forgiving as that they were a "high energy" ski, so to get the most out of them, they require pretty aggressive skiing most of the time, and that they return a ton of energy back too. I'm also interested in the Blackeye Ti, but think the Smoke Ti is all I need for my Intermediate-advanced intermediate skiing ability in north-east conditions. Mainly. I want something wide underfoot for light powder/crud conditions on the frontside for under $600. That's probably the greatest thing about this forum and the associated RealSkiers pay site. The reviews and knowledge of past year skis that where you can often pick up a pair of skis still in the shrink wrap for 1/2 or less of the original MSRP. Agree, these forums? allowed me to catch up with the latest ski technology trends after a long hiatus. Anyway , I went with the 164mm Smoke Ti . Hard to find them in stock anywhere and somewhat discounted. Now, I need my back to heal up. Never help anybody move when you're over 40.